Squibs And Crackers: The Girl Can Sing! Madison recently competed in a solo and ensemble competition with the other local middle school's. She was one of the singers awarded top score for her solo. 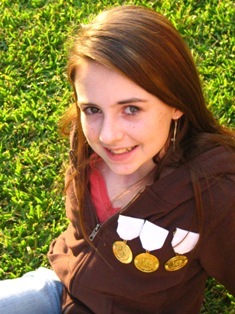 The additional medals are for the ensemble groups she was in this year and last year. Yeah, baby girl! Congradultions Maddy! I didnt even know Madison can sing. I feel like I dont even know my Texas family. Oh well, what can you do? yay me! that was acctually really scary! i dont like being judged :) but i did pretty good after all! all ones yay!